Breaking news: The best Oreo Cupcakes ever! Clearly you’ve noticed that the latest and greatest food fad is cupcakes. They seem to be everywhere I go. There are TV shows just about cupcakes. Cupcake shops are popping up on every corner. People are substituting cupcakes for a real cake at their wedding. Even my friends are making them. And the more intricate and detailed they are, the better. I have been, admittedly, somewhat enchanted by this whole cupcake phenomenon. Exactly a year ago for my birthday, my Long Lost Friend make me the most incredible cupcakes I have ever seen – totally edible, looked like a TV dinner! She got the recipe from the book Hello Cupcake! (which my friend and fellow blogger Una Lounder has to try, by the way). 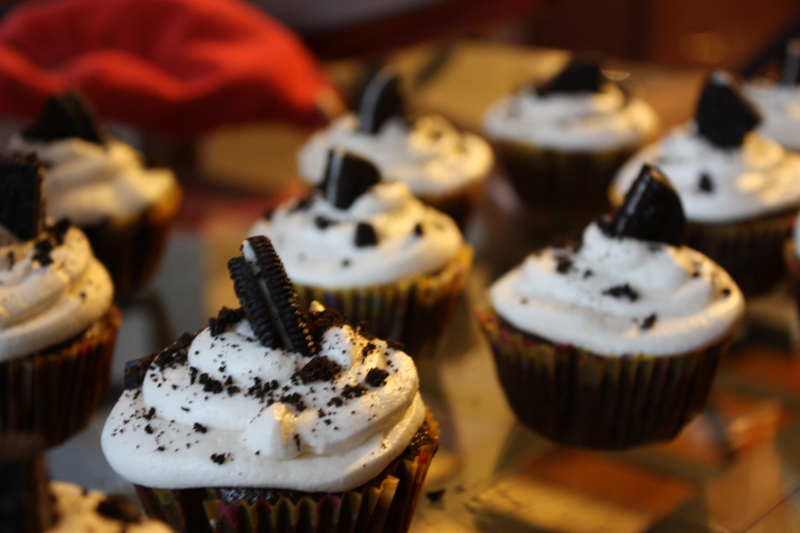 Then, my fellow j-schooler and friend Hilary Duff posted this incredible Oreo cupcake recipe on her blog. I absolutely loved the whole Oero cookie in the bottom, and Oreos are my favourite store-bought cookie. And Dairy Queen Blizzard flavour too. That was almost a year ago though, and I pretty much forgot about the recipe. And then can you guess what happened??? Yup, the obvious. Canadian Living came out with its own rendition of an Oreo cupcake recipe. And I was – predictably – sold. Hilary’s recipe – cream cheese icing, a whole Oreo in the bottom, chunks of Oreo throughout the cupcake. Canadian Living’s recipe – chocolate cake, generally prettier to look at. I ended up deciding to semi-merge the recipes. Sort of. Actually, I just made the Canadian Living recipe but put a whole Oreo in the base of each cupcake. That was the most important part, I felt. I was also fascinated by the Canadian Living recipe because the cake part is dairy-free. I had never baked anything without eggs before, so this intrigued me. And I wasn’t quite sure it would work. I was prepared for the challenge. Well… I don’t know how else to say this. The cupcakes were probably the best I’ve ever had. And I know that’s saying a lot, especially since I don’t like cake. But these were unreal. I couldn’t stop eating them! They were so moist and delicious – everyone who tried them agreed. The icing was the best non-cream cheese icing I’ve ever tasted. And the cookie in the base… well, it’s basically the best surprise ever. Now, I did forget to put the chunks of Oreo in the icing, but it didn’t make a difference. I took a dozen of these cupcakes to book club for De’s birthday and another half dozen for a potluck at work. They were GONE! A huge hit and an absolute must-make recipe. Combine flour, sugar, cocoa powder, baking soda and salt. Whisk in water, oil and vanilla. Stir in vinegar. Place one Oreo cookie into the base of 24 paper-lined muffin cups. Pour cupcake batter over top. Bake in 350 degrees until cake for 18-20 minutes. Let cool in pan for 10 minutes. Remove to rack and let cool completely. Beat together butter, icing sugar, cream and vanilla until fluffy. Spread on cupcakes and garnish each with a quarter Oreo. I can’t stop raving about these cupcakes. I think I know why they’re so good – they’re incredibly unhealthy. But they are dairy-free. And they are mouth-watering. So please – try them!!! You won’t regret it, I promise! thanks, mama… i know you don’t like cupcakes but these were amazing! Babes, I agree that these cup cakes are absolutly phenomenal but unfortch they’re not really dairy free unless you forgo the icing.. just a heads up to our lactose free friends! well yes… you’d have to substitute the icing for something dairy-free! My daughter is allergic to dairy and i made these for her and her class on her birthday. Just use Earth Balance butter and Soy whipping cream. I made 48 cupcakes.The kids and teachers all said there were the best cupcakes they ever tasted. It felt so good that my daughter could eat what everyone else was eating for a change! It’s amazing how good these cupcakes are with dairy! I am OBSESSED with these!!! Love, love, love!!!! Thanks Pat! I’ll have to make a double batch next time!! !